Instacart "personal shopper" can now opt to be part-time employees instead of contract workers. Turns out, contract workers might not be the answer to the on-demand economy. On Monday, grocery delivery startup Instacart announced a new option for some of its contract workers: become an employee. This comes after last week's ruling that one San Francisco Uber driver is, in fact, an employee. The finding is shining a spotlight on Uber and hoards of other startups that rely on contract workers. Since launching in 2012, Instacart has used contractors to pick up and deliver groceries to customers. But starting Monday, some of Instacart's Chicago workers can choose to be part-time employees. This just applies to the "personal shoppers" who pick out items for customers; its drivers will remain contract workers for now. 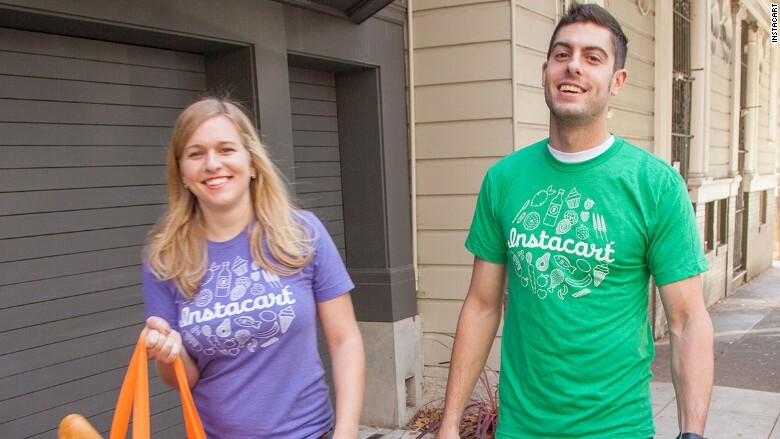 Instacart's decision to explore an employee model came before the Uber finding. The startup -- which has raised $275 million in venture capital and is valued at $2 billion -- has been experimenting with part-time employees in a Boston pilot since February. "The data showed that this change improved the quality and efficiency of order picking and made for a better customer experience," said Instacart founder and CEO Apoorva Mehta in a press release. It's something that cleaning startup Managed by Q realized from the beginning: In order to deliver quality service, it needed to be the best employer. And that meant hiring workers and offering benefits, sick leave and flexible work hours. "The general rule of thumb I've heard -- which resonates with our experience -- is that employees are 25%-30% more expensive than independent contractors," said Dan Teran, co-founder of Managed by Q. That varies depending on things like benefits and employee training. For Instacart, the biggest upfront costs will be worker's comp and payroll expenses, according to Instacart spokeswoman Andrea Saul. "[But] we think it'll be worth it to deliver better service," said Saul, who notes that they're now able to perform management trainings and provide more quality control. The wages Instacart pays its employees vary by market -- Saul said they pay more than local minimum wages, said Saul. As employees, they'll be eligible for unemployment, social security and Medicare. Most Instacart "shoppers" work between 24 and 30 per week. With the new policy, part-time workers won't be able to work more than 30 hours a week, as that tips them into the full-time bucket, which mandates healthcare coverage. Shannon Liss-Riordan, a labor lawyer who is representing Uber drivers in a separate case, said she was "very happy" to hear of Instacart's move. "Instacart is one of the major players in the area. I hope more companies come to this realization and that this is part of a trend we may be seeing," she said. Instacart, which now operates in 16 cities and has 7,000 contract workers, plans to roll out the option to other cities in the coming months.